Image: Jamie McCarthy/Getty Images, Yagi Studio/Getty Images/Design: Ashley Britton/SheKnow. 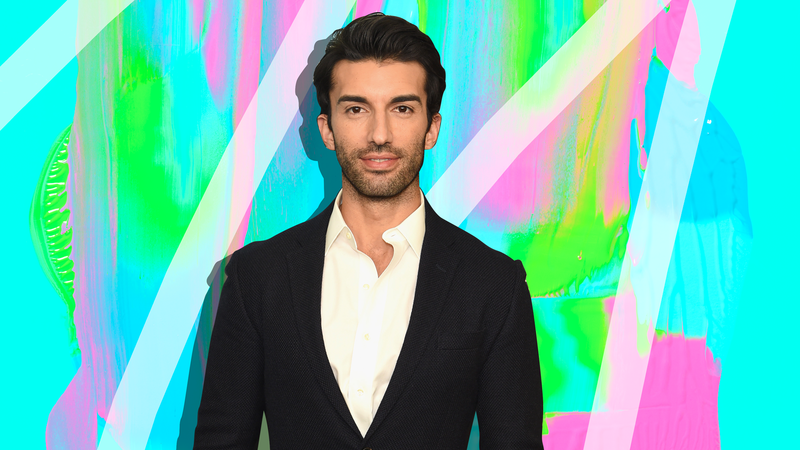 On the hit CW show Jane the Virgin, we've become familiar with actor Justin Baldoni as the lovable Rafael Solano, the on-again, off-again love interest of the titular Jane. Now, the actor is involved in a different kind of project: to encourage men to stand up and be better allies to women in the #MeToo era. He’s doing so with the launch of his new Facebook Watch series, Man Enough, a roundtable series that creates a space for men across all backgrounds to have an open discussion about some of the ways “traditional masculinity” has impacted their lives and the women in their lives. In the fourth episode, which premiered July 24, Baldoni is joined by actor Matt McGorry (How to Get Away with Murder), celebrity talent manager Scooter Braun, former Arena League football player and author Lewis Howes, political activist Jamey Heath and activist Tony Porter (CEO of A Call to Men, an organization that promotes healthy ideals of manhood) for an earnest conversation confronting patterns of behavior and how they can better hold themselves accountable and help support female advocates and survivors. The episode also includes the interviews with noncelebrity survivors whose stories ground the conversation and make it even more urgent. SheKnows recently caught up with Baldoni, who talked to us about why he launched the series, its role in the #MeToo conversation and what he’s doing to better support women. SheKnows: For the last several months, since #MeToo catapulted to the mainstream, you've become a vocal advocate in the modern feminist movement. What does being a male ally mean to you? Justin Baldoni: To be honest, none of this was really planned, and I really don’t have perfect answers for everything because so much of this public journey for me has been about learning. To me, being an ally is about learning: learning through listening, learning through doing and learning through feedback. As men, we need to have empathy and recognize that women coming forward to share their stories takes tremendous courage, and when those women come forward, we have to remember that they’re reliving pain and trauma each time they speak about these experiences. When we created Man Enough, we wanted to be sure that we were being responsible and thoughtful allies. So we leaned on the one thing I know, which is that I really don’t know anything. We consulted experts in the movement, as well as the women in our lives — friends, family members and especially my wife [Emily]. We also spoke with survivors. It was critical to us that their voices were included in this episode as well and made an effort to ensure the more marginalized voices, particularly women of color, had a platform to share their stories. This episode, and my work as a novice advocate, is about doing what I can to support the movement and to support those who have been doing this work and continue to do this work every day. SK: Man Enough creates a safe space for men to talk about some of the ways they've confronted, contributed to or enabled male toxicity. What are you hoping to accomplish with this new platform? JB: We created Man Enough in hopes of creating a safe space for men to talk to men — a judgment-free zone to be open about what we’ve seen, what we’ve been feeling, particularly the things men might be afraid to say out loud and learn how to move forward. At my core, I believe men are craving this type of outlet because we have been taught since childhood that sharing our feelings and emotions is a sign of weakness that challenges “how much of a man you are,” and we’re afraid to share. But it’s time for us to come together as brothers and explore the root of these ideas. Only then can we find solutions that will make us better allies and better men. And again, I know that this is not going to fix the problem, and honestly, it’s barely even a start. But at least it’s something, and we as men and allies have to start somewhere. SK: How do you think women and men can better communicate with each other in the #MeToo era? JB: While it sounds simple, I think the first step is honestly really hard. We have to listen. And not just listen and listen to the point that we hear. Because unless we hear what is being said, we can’t take action. By listening to the point that we hear what women have to say, especially in this space, we can understand what we can do to be supportive and contribute to the conversation. We just don’t always know what to say because we don’t have the vocabulary. I hope that this episode shows men that it’s OK to say the wrong thing and make mistakes as they start to engage in this conversation. None of us are perfect on the show around the table, but what’s important is that we all want to learn from each other, from survivors, from experts and from those in our lives. SK: Why do you think there's such a stigma against men talking about their emotions? JB: I think it starts with our socialization as young boys. Tony Porter and Ted Bunch from A Call to Men refer to this as “The Man Box.” This socialization is deeply rooted in silence. That silence cuts men off from one another and teaches them that sharing their traumas is the worst thing you can do. If you break these rules, we’re told that your “brothers” turn their back on you because they see you as less of a man. For a young boy, there is literally nothing worse on the planet than to be disowned by your own gender. It becomes life or death for us in school, and we’re so deeply programmed to believe this that we’ll suppress our feelings and shut off emotionally from our loved ones in order to maintain our sense of identity as the kind of men we’re told to be. The harsh reality is at least 1 in 6 men have experienced sexual abuse or assault (in childhood or as adults), so holding in our emotions only adds to this trauma. With Man Enough, we hope to shatter some of these stigmas and change the conversation so men can not only become better allies for women but learn to deal with their own emotional traumas. We want to create a safe space and teach men that talking from an honest, sincere and vulnerable place with each other can help us far more than it can hurt us. SK: Hearing the stories of the female survivors on the series is particularly poignant. What made you include the women's stories on Man Enough? JB: Once we started developing this episode, my team and I all agreed that including the voices of female survivors was crucial to helping men relate to the monumental importance of the #MeToo movement. The bravery of these women is so powerful and so important. We need to do everything in our power to support them and make sure their experiences are heard and recognized. None of their experiences were exactly the same, and yet they all went through gut-wrenching and heartbreaking trauma. We also wanted to make sure they were really heard and not interrupted. So, we left the men in one segment and created the spine of the episode around the women and their stories so that anyone watching couldn’t miss what they were saying. I really am in awe of these women, as well as the men, who shared their stories, as it’s so courageous and so difficult to go through that pain and trauma again every time they share their experiences. SK: The title itself, Man Enough, confronts the long-ingrained notion that there is a prototypical male behavior. What do you think men can do to counteract that societal belief? JB: Listen. Ask for feedback, and don’t be so afraid to do or say the wrong thing that you end up not doing or saying anything. Dive into the uncomfortable parts of who you are, so much so that you become comfortable in it. I think men are taught from a young age that certain behaviors make us less[er] men. It starts right from childhood when we learn that girls have cooties. Homophobia starts on the playground long before any of us really even understand the differences in genders, so it’s unconsciously like we’re drawing a line in the sand. Whether it’s opening up our vulnerabilities to seek help or embracing our emotions, we want to challenge the traditional narrative and call on men everywhere to be “man enough” to open up to each other, form deep and meaningful relationships and see our feelings as a source of strength and courage rather than weakness. The reality is that men can be tough, emotionally literate and all the things in between without needing to lose who we are as men. I don’t want us men to stop being men; I just want us to realize that we are so much stronger than we think we are and that true strength is far more dynamic than we have been socialized to think it is. SK: What would you like female audiences to take away from the series? JB: I want women to know that we hear you and that we are working to become better allies and engage men in that conversation as well. I also want them to know that we realize that this isn’t going to fix the problem or take away any of their pain or the trauma they have and continue to experience. We don’t have the answers, and we are searching for ways we can help. We are going to mess up and say the wrong thing and fall short, but that we are trying. At its core, this is an exploration of gender — masculinity and femininity— [to] understand its social constructs and the barriers that we are working to break down. We hope that by the end of all of this we can all see a bit more of our shared humanity and realize that we aren’t as different as we have made ourselves out to be.